Disney’s 56th animated feature film comes in the shape of Moana, a film that takes the audience on an adventure across the ocean with the usual mix of beautiful animation, heartfelt narrative and catchy songs. Disney have already had a strong year with the likes of Zootopia and Finding Dory so the pressure was on for them to deliver a hat-trick for the year. Moana Waialiki (Auli’i Cravalho) is the daughter of the village chief who’s tribe lives on the Polynesian island of Motunui. 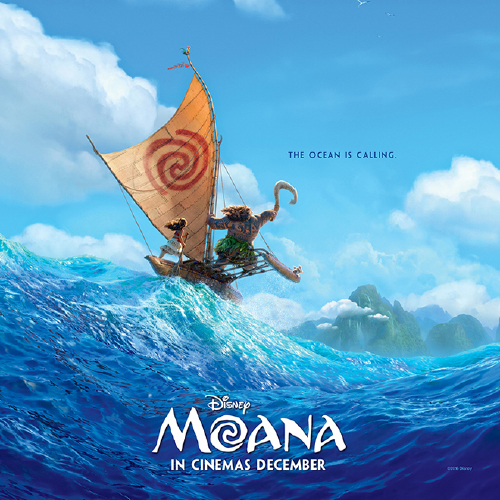 Having a connection with the ocean since a very young age, Moana has always been stopped by her father, Chief Tui Waialiki (Temuera Morrison), from going out beyond the reef. When she hears of the legendary demigod Maui (Dwayne Johnson) and how he holds the key to stopping Matunui from decaying, Moana sets sail across the dangerous ocean to locate Maui and have him restore the heart of Te Fiti, an island goddess, so she can restore life to Motunui. As I’ve already mentioned, Moana brings a lot of classic Disney traits to the table and it does it so well, putting it up there as one of the best Disney films in recent years. The animation on show in Moana is just stunning, awash with such vibrant colours, bringing the ocean and characters to life quite brilliantly. I really enjoyed the film’s writing of both narrative and characters too; the story being one that resonates with real life and having to look after our planet, along with the emotional family element that really sets the story in motion. The film is very funny as well, Heihei the rooster stealing many scenes and a nod to Mad Max: Fury Road as Moana and Maui run into a group of Kakamora pirates on the ocean. Never thought I’d ever be seeing a homage to that particular film in a Disney animation. The characters are as colourful and strong as the animation, and the voice work from Dwayne Johnson and Auli’i Cravalho is top notch, both sounding as if they’ve fulfilled a dream of playing a character in a Disney animation. Then there are the songs of Moana, beautifully written and performed by the respective cast members, my personal favourites being You’re Welcome and I Am Moana. Moana really is top tier Disney and while I think I preferred Zootopia, Moana is superior to Frozen, Disney’s biggest smash-hit in the past few years. I know what I’d rather see a sequel to.